William Street’s newest resident and Perth’s first natural wine bar and shop Wines of While has just opened their doors after a year-long battle to license the joint—and let us tell you, it’s well worth the wait. We’re not sure if it’s the struggle that’s made this place so lovable, or if it’s simply the fact that from fit out to menu to wine list, it’s difficult to fault. Probably both. Lodged in a quiet spot at the top end of the strip, Wines of While is offering up takeaway and dine in prices on an impressive selection of natural wines from all over the world, including some seriously coveted stuff that owner Sam Winfield has been collecting for some time, in long-held anticipation of opening his own venue. But this is one wine bar where you can enjoy first-class wine without the pretention—the fit-out is casual, the staff welcoming, and the vibe distinctly communal. Centred around one main heavy-wooded bench that seats about 15 and doubles as the service area, the bar features the original floorboards and ceiling detail of its heritage building, modernised by a feature hand-welded steel shelving unit and glass rack, fresh white walls and olive green accenting. Two street-facing ceiling-to-floor windows give way to an abundance of natural light, and tables are scattered both inside and out—which to us spells ideal spring-afternoon people watching over a glass of wine or two and some cheese. That brings us to the food. The menu isn’t set in stone—in fact, it’s chalked up daily—so we can’t tell you exactly what to expect upon your visit except for a welcome surprise. Rustic Italian and French-inspired cuisine is Winfield’s main game, and there’s an emphasis on quality ingredients and honest, wholesome dishes that’ll fill the belly but won’t break the bank. The offering is share style—think sliced meats (that fennel salume…), terrine, pork rillette and gherkins, pickled vegetables and house-baked bread (oh, the bread! )—but super refined. You can tell a lot of thought (and heart) has gone into the overall customer experience, with the food and wine pairing effortlessly. A few things that might be gracing the menu with some level of consistency are the soaked cannellini beans, served up in oil with salt—simple, hearty and more delicious than you can imagine—plus sautéed greens with oil and chilli that ring of Nonna’s cooking. On top of that, the chalkboard will feature different, more substantial daily plates until they run out—think fresh, easy pasta and lemon tart to boot. And, of course, the cheese platter probably won’t be going far—you can get three seriously melt-in-your mouth cheeses with the aforementioned (and soon to be famous) bread and house-made gluten-free flatbread crackers for just $15. And, of course, the wines. If natural wine is whole new territory for you, you’re not alone. 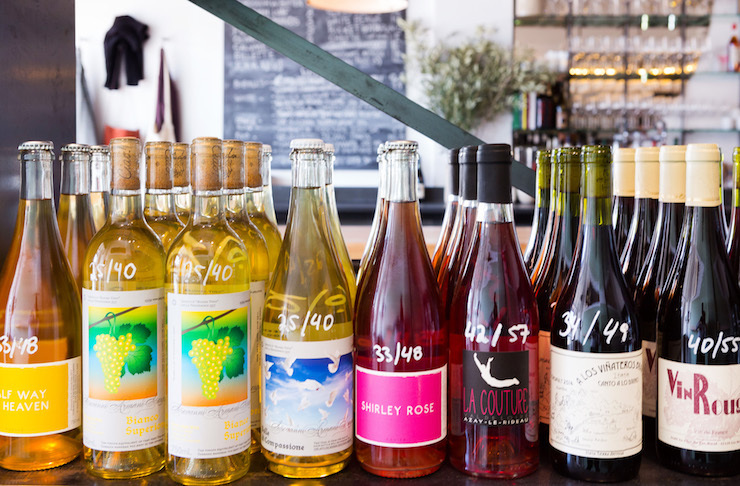 Winfield wants to help educate people about what exactly constitutes ‘natural’ wine, and clear up some of the stigma around its quality and taste. We reckon one glass and it’ll be clear as mud (or should we say clear as sediment?) to most—the wines on offer are tasty, fun drinking that make for the perfect night out with friends. With the by-the-glass offering changing according to stock levels, you can expect to try something new every time you visit—and if you seriously know nothing, don’t worry, the staff are knowledgeable and will pour you something delicious. Otherwise, peruse the shelves and find yourself a treasure to sit down with or take home—you definitely won’t be disappointed with the variety! Sounds amazing, and it is. But the best part? We think Wines of While is only showing half its hand so far. Exciting things to come! Obsessed with wine? Of course you are (so are we). Here are the best wine bars in Perth!